A few weeks ago, we covered the different types of garage flooring types available to homeowners. However, what if you never have put down epoxy or protective paint? What if you’ve had an oil stain on your floor for years, and want to make this the year that you finally get rid of it for good? You are running out of weekends to work on outdoor tasks—maybe you make this the weekend you get rid of that stubborn spot? Today, we’ll share with you the best garage cleaning tips and some products to get the job done. Getting rid of tire marks, dirt, grime, oil, and oil may seem impossible, but with the right tools, you can easily remove even the most stubborn stain. 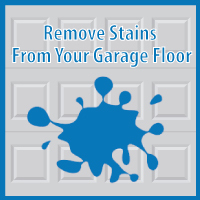 However, before jumping into the tactical removal of the stains and tire marks, it helps for you to understand how to properly clean a garage floor. Learning the best way to clean a garage floor properly is a skill that is high on most home improvement lists. Depending upon what type of garage floor project you have chosen and how dirty your floor is, there are different methods of cleaning a concrete floor that you may want to engage. Remove anything from your garage that isn’t anchored down. Cover all Electrical Outlets and drywall lower than 3 feet with plastic. Sweep out all dirt, dust, leaves, and any other dry debris. Now that you have the basic cleaning out of the way, you can finally make progress on tire marks, oil, grease, and whatever else has made its way onto your floors. Advanced garage floor cleaning, if you can consider it as such, is actually quite simple. Apply bleach to the stain (using a spray bottle is the most efficient way to apply bleach). Let sit 20 minutes. Scrub with a scrub brush and rinse. Avoid getting bleach on your clothing as it will stain, and avoid contact with skin and especially eyes. Spread a thick layer of fresh kitty litter over the spot. Allow to sit for two or three days. Sweep (or shop vac) kitty litter and dispose of in the trash. If stain still remains, sprinkle the area with DRY concrete mix. Allow to sit for two or three days. Sweep up dry concrete. An important thing to remember, but surprisingly common mistake: DO NOT dispose of dry concrete in sewer, sink or toilet—among other things it WILL cause plumbing problems! Wet the area and use an over-the-counter degreaser, such as ORANGE CITRUS concentrate. Allow the degreaser to sit on the spot for a few hours. Scrub with a scrub brush and rinse. Combine an ounce of trisodium phosphate (TSP) in a gallon of hot water. Wet the concrete and use a push broom with rigid bristles to scrub. Let the solution soak into the concrete for 10 to 15 minutes. Rinse thoroughly. Cleaning your garage at the end of the year may sound counterintuitive, with salt and other marks bound to mess up the floor again, but cleaning now will help to minimize the layers of dirt. Maybe after cleaning, it may be the best time to choose a new floor coat so you can minimize the hassle of cleaning this floor.